At Alaska Pediatric Surgery we have a team to help your child and your family through the surgery process. This means that you may see one or many of us through the process of your visit to our clinic, the day of surgery, time in the hospital and follow up afterwards. That is a lot of opportunities to meet someone different! Please allow us to introduce ourselves and we look forward to meeting you along the journey. 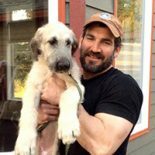 Dr. Brent Roaten is Alaska’s most experienced, board certified, Pediatric Surgeon. He specializes in general and thoracic surgery in neonates, infants, children and adolescents. Dr. Roaten is also available for prenatal consultation. He serves as the RI for Surgery Children’s Oncology (COG) program. Dr. Roaten is honored to be the founder of the Stephen G. Jolley Lectureship, providing funding for an annual symposium with guest speakers renowned in the field of Pediatric Surgery. The series further enriches Alaska’s knowledge of pediatric care. Due to his commitment to Alaska and his leadership in the Pediatric Surgery community, his time is in very high demand. When he finds time away from children’s health, he is engaged in technical mountaineering and conservation efforts. He has logged many hours on some of Alaska’s greatest peaks. When at home, Dr. Roaten is spending time with family, friends, and Mike and Murphy (both Irish Wolfhounds, Murphy pictured here with Dr. Roaten). Dr. Monja Proctor was born and raised in Texas. She trained in general surgery at The University of Texas Southwestern in Dallas and completed a fellowship in pediatric surgery at The Hospital for Sick Children in Toronto, Canada. She is board certified in pediatric and general surgery. Her clinical interests include congenital malformations, neonatal surgery, and laparoscopy. Dr. Proctor was in surgical practice in Seattle for 12 years before joining Dr. Roaten in Anchorage. She enjoys working closely with families before, during, and after their child’s surgery to ensure smooth, predictable, and coordinated care. Outside of work, Dr. Proctor enjoys traveling, running, and sharing family time, on and off the soccer field, with her teenage sons. Dr. McAteer was born and raised in Wyoming, spending most of his childhood in the great outdoors. 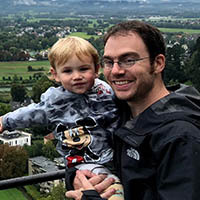 He attended medical school at the University of Washington in Seattle and stayed at UW for general surgery residency and two years of research at Seattle Children’s Hospital. He completed his pediatric surgery fellowship at Children’s National Medical Center in Washington, DC. Dr. McAteer became interested in pediatrics because of the positive outlook and motivation children have in confronting illness, and the great reward that comes with helping a child overcome disability or disease. His specific interests include advanced minimally invasive surgery, surgical outcomes, and rural outreach. Dr. McAteer is excited to have the opportunity to work in Alaska and to help build a program focused on caring for children on a statewide scale. He considers the long term care of patients and their families as an integral part of caring for children with surgical needs. 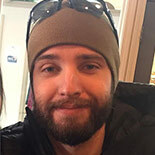 When away from clinical duties, he enjoys fly fishing, bow hunting, hiking, playing guitar, and, most importantly, traveling and spending time with his wife (a Fairbanks native!) and son. Kristi Davis was born and raised in Alaska. She has an extensive background in business development and operations. 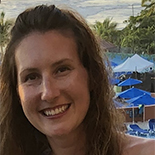 Kristi has her Master’s in Business Administration from The University of Alaska Anchorage and is active in the Alaska Medical Group Management Association. Kristi is passionate about bringing high-quality healthcare services to the children and families in her home state. 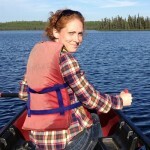 When Kristi is not working or volunteering, she enjoys running, camping, traveling and spending time with her family. 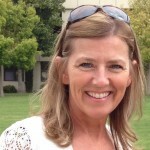 Betsy has a Masters in Physician Assistant Studies from A.T. Still University- Arizona School of Health Sciences. She has a professional background in Thoracic Surgery and Interventional Radiology. Betsy and Dr. Roaten have been working together since 2013. 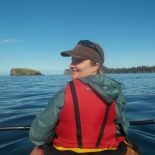 When Betsy is not helping kids at work, she enjoys camping, hiking, curling and exploring Alaska with her husband, their two sons, two dogs and cat. Jessica obtained her physician assistant certification (PA-C) from the National Commission on Certification of Physician Assistants (NCCPA). Her passion for caring for children led her to pursue a career in Pediatric Surgery. Prior to this endeavor, Jessica began her medical career as a registered nurse after graduating from the University of Montana. She was inspired by the pediatric population she worked with as a nurse in the pediatric and neonatal intensive care units. 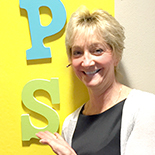 Jessica joined the team at APS to further help the children of Alaska. 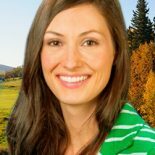 Jessica was born and raised in Missoula, Montana. In her free time, she enjoys hiking, fishing, and downhill skiing. Sean Walsh was born and raised in Alaska. He graduated from the University of Washington MEDEX Physician Assistant program in Anchorage, Alaska. Prior to PA school, he was a navy corpsman with 1st Battalion, 7th Marines. He chose to work in pediatric surgery because of the unique challenges and rewards of working with children. While not at work, he enjoys hunting, fishing and spending time outdoors with friends, family and his two dogs. Ronda was born and raised in Anchorage and has lived here all but eight years of her life. For those eight years, she was in the US Navy. Ronda graduated from UAA with her BSN and worked for many years as an RN in Pediatrics/PICU at Providence Hospital. She graduated from Saint Louis University’s MSN program as a Pediatric Nurse Practitioner in 2010. Ronda currently works full-time as an NP in Pediatric Oncology and not quite part-time with Alaska Pediatric Surgery. When she is not working, Ronda loves spending time outdoors with her two sons. Linda was born and raised right here in Alaska. After 17 years of management in the insurance industry, she returned to UAA to earn her RN. Linda has been working with pediatric surgical patients ever since. She has two adult sons and recently adopted a little boy who keeps her very busy! 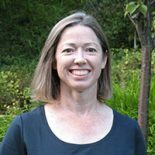 During her ‘free’ time, Linda enjoys hiking with her Australian Sheep dog, skiing, knitting and spending time with her family. Susi came to Alaska in 1981 when she attended UAF studying Marine Biology. Her studies eventually turned from little marine critters to children, and she finished her studies with a Bachelors of Elementary Education from UAA. She has been blessed as a stay-home mother raising two girls. Her youngest is currently attending UAA. She and her husband have a combined family of six adult girls and four grandchildren. Family comes first and that’s why she works with her new family: the APS team! Dr. Roaten originally studied archaeology in college. Dr. Proctor doesn’t have a middle name. Susi had a pet monkey when she was a kid. Sean has ridden the World’s Longest Outdoor Escalator- in Hong Kong. He did not get a t-shirt and regrets it to this day. Jessica’s most memorable show and tell was a gigantic goose egg she found in first grade. Ronda loved her kindergarten teacher so much she wanted to be one when she grew up. Betsy was once chased by a yearling moose in the Providence hospital parking lot. Betsy dropped calculus in high school. She promptly looked for something to do with her life unrelated to math. Jessica loves to fish. Salmon fishing is her favorite. Linda was married on the Ruth Glacier, pretty darn Alaskan there. Ronda drove the Alcan when she was two years old. It was entirely gravel then. Betsy played rugby in college. Sean had nine dogs growing up. Dr. Roaten attempted a climb of Denali, but was weathered out right before he reached the top. Jessica ran track and did cheerleading in high school. Dr. Proctor almost walked right into a moose walking into the hospital. There is a street named after Susi in Fairbanks. Linda was on the downhill skiing team for her high school. Sean played baseball as a kid and only got on base when struck with the ball. When Linda was five she wanted to be a race car driver.